NAUGATUCK — The Naugatuck girls swim team is poised to make a splash in the Naugatuck Valley League this season. That doesn’t necessarily mean they will challenge for an NVL title, but things are certainly looking up for a team that has finished in sixth place three years in a row. A large freshman class has head coach Jim McKee excited about the team’s potential heading into the season. Senior captains Katie Brown, Abrianna Hasipi, Taylor Siefer and Francesca Spino will provide the leadership for the younger girls as Naugy looks to improve on last year’s 6-4-1 mark. Seniors Julianna Scully, Maria Guimaraes, Brin Battisti, Faith Rawding and Sarah Rawding add to the leadership for the Greyhounds. Juniors Meghan Korowotny, Emily Sarmiento and Molly Kennelly are back, and sophomores Katelyn Fortney and Abbey Shugdinis made an impact last season in their first year. The freshman class is made up of 12 talented swimmers from the middle school system. McKee has high expectations for Jacqueline Uva, Haley Deller and Alena Rotatori, who all have the ability to be four-event swimmers. 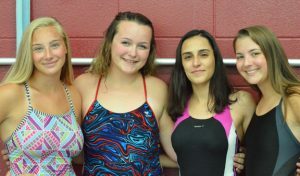 Karly Bartek and Davinity Smallwood have also caught the coach’s eye as swimmers who could be swimming at the NVL meet. The key, the coach said, will be putting in the work in the pool. Naugatuck gets the season underway on Sept. 14 at home versus Torrington.